I am going to Iceland this summer for about a week and a half. I've made two trips in the last three years where I didn't follow my normal routine for packing and trip planning and it showed. I usually make a list of things I will need and I mark them off as I'm packing them both departing and returning, so I know I'm bringing everything home with me. Usually I'm gone for a week or more, so I tend to bring more stuff, so the list really helps. First, I went to Minneapolis to visit with Kiy and would only be gone 2 nights, and needed a minimum of clothing/accessories. So, no list. As a result I forgot something, and had to pay to have it shipped back to me. If it was a tube of toothpaste or something along the disposable lines, no problem, but in this case it was my down pillow I got in Iceland. I couldn't just replace it at my local Target. I'm not saying write down a precise description of everything; 3 - shirts, 3 - jeans, 1 - pillow would have sufficed in this case. The second trip was two years ago when my daughter was born, can you believe I forgot to bring the camera???? I had taken it into the nursery to take pictures since we were finishing up a few last minute things when we got the call that she was on her way. We had an hour to put things away, grab our stuff, run the dogs to my brother-in-law's and head out of town. Halfway there I flashed on an image of the camera sitting on the shelf in the nursery where I left it and almost started to cry. Hubby said "We'll just buy a new camera" which we did as soon as we got to town. The new camera wasn't as nice as the one we had, but it got us through her first three days. Forgetting the camera was COMPLETELY avoidable if I had ran through a quick list. Now with a little one to pack for as well, lists are more important for me than ever. I can't imagine the crying and hysterics I would endure if I forgot her beloved blanket or Pooh somewhere. It's bad enough when her blanket is in the washing machine. Thankfully, I don't have to cart around near as much as when she was a baby, but trying to carefully plan for what she'll need for 8 days in Iceland is going to be difficult. I'm actually in full potty training mode just so I can hopefully eliminate a large number of diapers and wipes and all that that entails from the list. She'll be quickly thrust into a "big girl" world like real tableware and no crib. I'll try to prepare her a bit over this month. 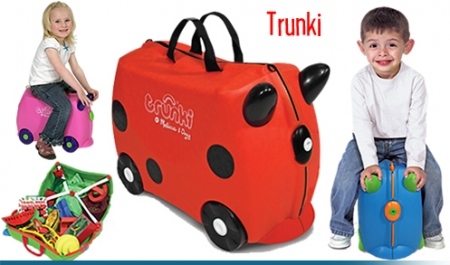 I also picked up a Trunki for her from zulily or OpenSky for more than 50%, I can't remember which. I'm thinking it was OpenSky though the more I think about it. She loves riding around on it and calls it her car. I'm hoping getting used to it and then having it packed full of special things for her trip will make everything go smoothly. Well, as smoothly as one can hope for with a 2-year old! 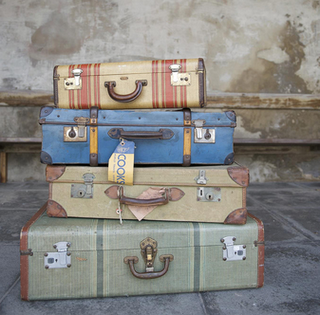 Do you have any tips for traveling with a toddler? I'll be compiling a list of what I am doing for a post in a couple of weeks, I'd love to feature your tips as well!